My sisters and I lost our mother last week, and my father lost his wife of nearly 66 years. I wasn’t going to write about it. The emotions are too raw; it seemed I would always be able pick up the phone and call her—“Hi, mom!”—or hop in my car and drive over there. Who else can love you, so unconditionally, like mom? Now, as I move through each new day, I keep thinking: am I really, in this life, never going to see her again? Or share a meal? Or hear her voice? It seems impossible, surreal… like I said, raw. But it occurred to me: there’s also a love story here that brings a smile to my face, the love affair between my father and mother. I confess I haven’t put much thought into it over the years—who does with their parents? But sitting with dad just the other night made me pause and take it to heart. It was the day after mom had passed and we were eating dinner together, a solemn meal over a beautiful bouquet of sympathy flowers, and I asked dad to tell me again how they’d first met. I’d heard stories about their courtship, of course. The one about the drive-in movie is a family favorite, when a teenage Clayton finally built up the courage to turn to Hazel and say “I like you,” and Hazel responded, “I like you too.” But I didn’t remember how they first made contact. It was risky to ask about it, so soon after my mom’s death. I didn’t want to cause him more heartache. But he didn’t seem to mind the question, and while the story he told was brief, he delivered it with a smile. He said he’d seen my mom in the school library (they both went to Portland’s Franklin High) and decided to ask her out. So he had a friend who knew her call ahead to tell her about him, then he telephoned with the big question: Would she go on a date with him? As they spoke over the phone, so the story goes, my mom couldn’t place Clayton and wasn’t even sure she’d seen him before. But the mutual friend had reassured her he was a good guy, so she said yes to a double date then hurried to tell her sister Bobbie and mother Bessie. All three—Hazel, Bobbie and Bessie—were curious: would Hazel know this mystery boy when she saw him? Scheming together, the three came up up with code words Hazel would use as she left on the date. If she’d seen him before, she’d say “Goodbye,” if she hadn’t, she’d say “Goodnight.” The conclusion of dad’s little story went like this: On that fated evening, when he arrived and Hazel came out, ready to go, she shot a big grin back to the house and said “Goodnight!” –she’d never seen him before! That was the beginning of a relationship that lasted nearly seven decades. Within two years, they were married, my father at age 19 and my mother, 18, babies really, though dad had already been in the army in post-war Germany. Over the years they had daughter after daughter, and their life together brought great joy, but also pain and grief. For the sake of my parents’ privacy, I’ll skip the details. What matters now, what really strikes me, is the incredible endurance of their love. Mom wasn’t well for quite some time before her passing. When she was diagnosed with Lewy Body Dementia, we considered options for memory care, but my father’s wishes were to keep her at home, with him. It wasn’t easy, especially for dad, but with help from his four daughters and an absolute angel of a great-niece, Melissa, we were able to make it work, and mom was well cared for. Then, about two weeks ago, she suffered a stroke. We all knew the end was near, and as we said our goodbyes, I told mom what I truly believe: that God has a place, reserved just for her. It was during those days that I finally understood the depth of my parents’ love. They’d been through so much together, good times and bad, but what I saw in the end was how their relationship had evolved through tumultuous times from youthful attraction to everlasting devotion. There was a moment I’ll never forget that I’m blessed to have witnessed. It was after the stroke, when mom could barely speak, and dad, in a chair by her bed, began to sing to her. Dad was famous in our household for singing over the years, often striking up tunes with us kids or one of his brothers, so I eased back, away from the bed, to sneak a few pictures. The funny thing is, as he sang, I realized, I’d never heard the song before. “Remember this one?” he’d asked my mom before launching into the tune. I had no doubt she understood. She looked him square in the eye and did what had to have been difficult for her after the stroke: she lifted a pale, weak hand and grasped his. What my father proceeded to sing was a love song, nothing short of heartbreaking. It was written, I found out later, by Floyd Tillman and popularized by Patsy Cline. I’ll leave a link with Patsy Cline’s rendition below. There really isn’t much more to say. Once you hear it, the same words dad sang to mom, you’ll understand. What am I thankful for? I’m wondering if you know the feeling: you’re hosting Thanksgiving dinner, crazy busy getting everything ready–What time did I put the turkey in?–then finally, everyone is gathered, the potatoes are mashed, the gravy done, and you call the masses in to eat. But it’s only after everyone’s seated and halfway through their meals that you realize you forgot to give thanks. On Thanksgiving Day! I confess I’ve done this and ended up feeling like an overstuffed, ungrateful birdbrain–all before I’d even had pie! First, I’m thankful for the grace of God, and how, despite evil and heartache (too much of which we’ve seen lately), hope and goodness shine through. …and for our kids (who for some odd reason never learned to clean house). …and for my sisters, for all our years together, and that we’re each able to help with mom and dad. …and for humor, EVERY SINGLE DAY, which keeps me sane! And, finally, I’m thankful for this life, however flawed, and hope that, one day, when it comes to a close, I’ll have family beside me and the presence of mind, one last time, to give thanks. 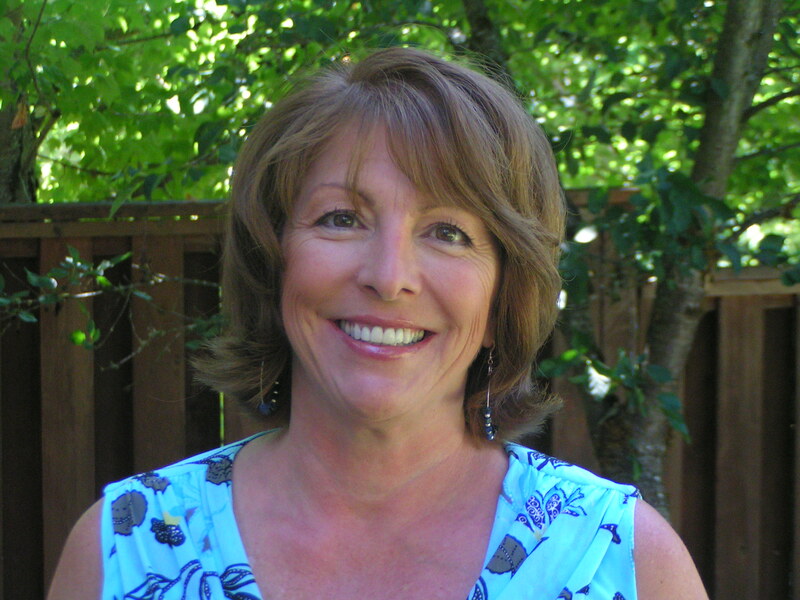 Marcia Coffey Turnquist is a writer and journalist. 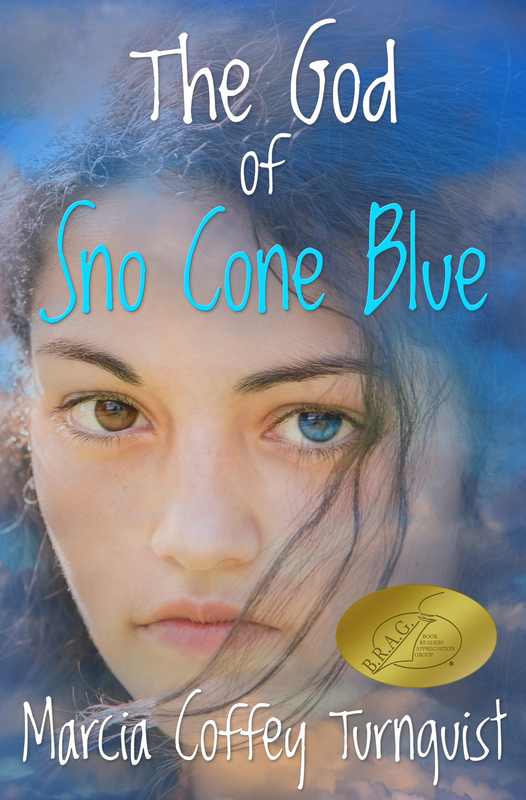 The God of Sno Cone Blue is her debut novel. Follow Marcia Coffey Turnquist on Google+!